This is a foreign exchange guide to Guyana, the Guyanaese Dollar currency plus GYD transfers and travel tips. Guyanaese Dollar exchange rates - latest & historic exchange rates. What is the Guyanaese Dollar currency code and symbol? The three letter currency code for the Guyanaese Dollar is GYD and the symbol is $. Which countries use the Guyanaese Dollar? It is the domestic currency in Guyana. The interactive chart below shows the USD to GYD exchange rate for the previous 3 months with rate alerts for days when the exchange rate moved up or down significantly or for 30 day highs and lows. The likes of Chile, Argentina, Colombia, Peru and Bolivia often top travellers’ ‘must visit’ lists when they decide to head to South America. Guyana, on the other hand, seems to attract a far smaller crowd. But the abundance of cultural and natural sights, the lack of other travellers and it’s general ‘off the beaten track’ vibe help make Guyana a rather unmissable stop. 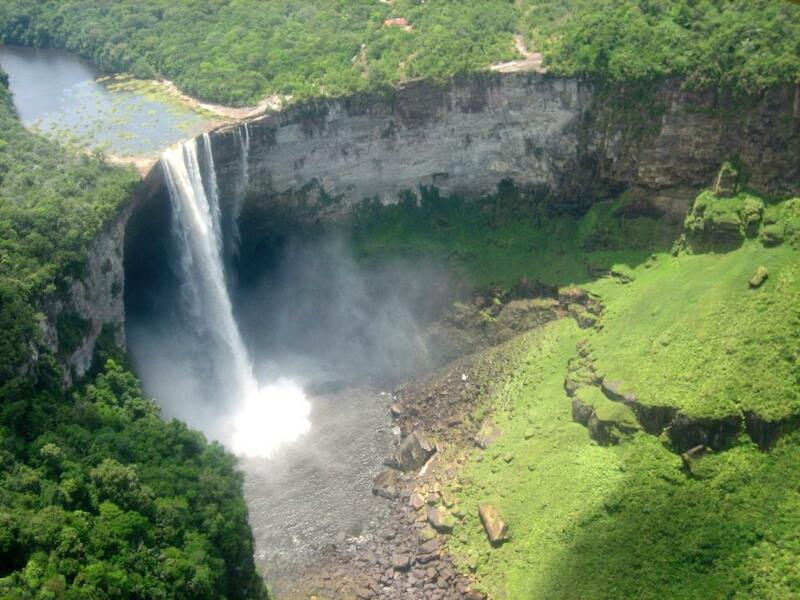 Kaieteur Falls is the world's largest single drop waterfall by the volume of water flowing over it. Cambios are licensed currency exchange houses. Most cambios are open from 8:00 hrs to 17:00 hrs and on Sundays 8:00 hrs to 16:00 hrs. It is important that you keep your cambios receipt, you will need to produce them to change Guyanese dollars on departure. Major credit cards and travellers cheques are accepted by most hotels, restaurants, supermarkets, car rental agencies and tour operators. Credit cards with CIRRUS and/or PLUS mark can be used at any Scotiabank ATM machines in Guyana. How to get around in Guyana? There are no international railway services to Guyana nor are there any domestic services. This is due to the fact that the entire system, the first in all of South America, was scrapped during the Burnham regime. When people in Guyana refer to buses, they mean minibuses. Minibuses travel throughout Guyana and are the cheapest way to travel Many parts of Guyana are separated by large rivers. These areas can be traversed by way of river taxi. Buses are the main way for locals to get around the country, and while they're a fascinating cultural experience, they're also uncomfortable, overcrowded, noisy and in many cases downright dangerous, with drivers who seem to care little for the safety of passengers or pedestrians, terrible road conditions and the ever-present threat of pickpocketing. Guyana is comprised of an incredible 80% virgin rainforest. While a lot of locals use bikes to get around Georgetown and a few other places in the country, it's not easy to recommend owing to safety issues caused by poor roads and dangerous driving. There is also nowhere to rent a bike. The official language is English often spoken with a creole flavor. Guyana currently only receives about 3,000 tourists a year, which, to put it in perspective, is about the same as Machu Picchu receives in a single day. It’s the same size as Britain but has a population of fewer than 750,000 and is comprised of an incredible 80% virgin rainforest. The fact that Guyana only receives 3,000 tourists a year means that it’s not uncommon to have places such as Kaieteur Falls – the world’s tallest single-drop waterfall (five times the height of Niagara Falls) – completely to yourself. It is safer to drink purified bottled water. There are several brands that are inexpensive and widely available. Guyana's climate is equatorial; hot but pleasant for most of the year. The heat is tempered by the sea breezes on the coast. An Umbrella is useful during the two wet seasons, extending roughly through May and June and from December to the end of January. Once colonised by the Dutch, then the British, then the French, then the Dutch again, Guyana is now made up Amerindians, Africans, Indians, Europeans, and Chinese. All this has led to Guyana becoming a fascinating mixture of religion, culture and cuisine that you can’t find anywhere else in South America. Save money and time by Ordering your Guyanaese Dollar online from Travelex, you get better rates and can pick up the GYD cash locally or even on travel day at the airport. For card purchases if offered a choice of currencies always select to Pay in Guyanaese Dollar otherwise you may get much worst exchange rates. Compare GYD travel cash rates - probably why you are here! When searching around for information on how to get a good exchange rate when sending money to Guyana you need to start with finding out the latest Guyanaese Dollar foreign-transfer exchange rate. Once your funds are received by the provider the converted GYD amount will be transfered to the recipient account you specify in Guyana. Use our Send to GYD calculator to compare the exchange rates of FX specialist providers rates versus your bank's standard rates you can hopefully save around 5% and maybe more - end result is more Guyanaese Dollar deposited into the recipient bank account and less margins and fees kept by the banks!